Stephenson SWCD is taking orders for Rain Barrels and Composters. The rain barrels are 55-60 gallon converted food product barrels that have been sanitized, assembled with a rain water input, overflow, and drain spigot. Each barrel has a screw-on lid fitted with screening to prevent entry of leaves and debris. The rugged rain barrels stands 35-40 in. high. 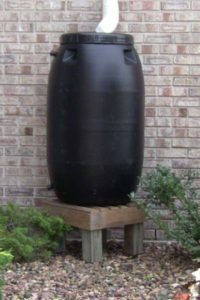 Cost of rain barrels is $65.00 and these come in gray and terra-cotta. Other colors are available by calling the Stephenson SWCD office. Please call or stop by the office for additional information on these products. Rain barrels are 55-60 gallon converted food product barrels that have been sanitized, assembled with a rain water input, overflow and drain spigot. Each barrel has a screw on lid fitted with screening to prevent entry of leaves and debris. Rain Barrels are available in Black, Gray and Terra-Cotta and cost $65.00 each. Typically rain barrels are placed at the bottom of downspouts in order to collect rain as it runs off of a roof. For every inch of rain that falls on 1,000 square feet of roof, about 600 gallons of water can be collected. 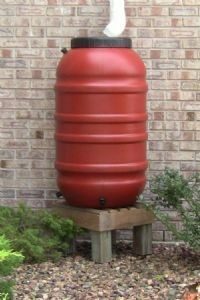 The primary purpose of a rain barrel is to provide homeowners and gardeners a source of soft, slightly acid water that is typically preferable to city water (which may be chlorinated) or well water (which may have excessive mineral content) in which to water plants, gardens and lawns. Rain barrels can also reduce the potential for basement flooding by directing water away from your home’s foundation. 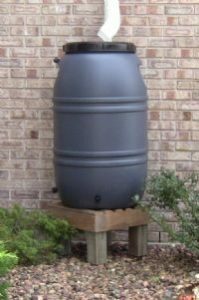 Rain barrels reduce the amount of water running into lakes and rivers thus reducing erosion and helping prevent storm water pollution of lakes and waterways. Lawn and garden watering makes up nearly 40% of total household water usage during the summer use your rain barrel to collect and store water for when you need it most – during periods of drought to water plants, wash your car, or wash your windows. A rain barrel will save most homeowners about 1,300 gallons of water during the peak summer months. Saving water not only helps protect the environment, it saves you money and energy – a rain barrel is an easy way for you to have a consistent supply of clean, fresh water for outdoor use, for FREE.